In a few days, a cable tv station in the US will premier its 16-part adaptation of a very well-known series of historical romance novels. Set in Scotland just before, during, and after the Jacobite Rebellion of 1745, the (now nine) novels were written by an American author from the Southwest. I began reading them just after the fourth one was published. They had been suggested to me by a friend who had been reading the series, and who knew of both my love of Scotland and my association with Clan Fraser. The fact that I was working in the alternative healing arts and a budding herbalist (sorry), was not lost on her either. She didn’t tell me anything about any of that, though. She merely recommended the books. I politely wrote down the author’s name and slipped it in to my wallet. A few months later, I was in my favorite café in Sedona, perusing the local “what’s happening in town” newspaper. I came across an ad for an “Outlandish Tea” and book signing which listed an author’s name that was familiar to me, except that I had never read any books written by her. As I kept on reading the paper, the name swirled around in my head until it landed squarely upon the memory of the note in my wallet. Sure enough it was the same author. The following Saturday, I found myself up in Flagstaff at a high tea, seated at a table with seven women whom I did not know. I listened to their conversations about the Outlander books, and, when I was asked about my opinion of them, I had to admit that I had never read any of them. What followed was a wonderful briefing from all of them on the storyline, which I found to be very intriguing. After the tea service, the author, Diana Gabaldon, was piped out to the podium and began to speak. She was articulate and funny, especially in her way of being mildly self-effacing. I am not one for the romance genre, which is how these books were classified back then; and, I would rather read history than historical fiction. I was, by this time, however, very ~ no, extremely ~ intrigued. I bought all three of the series that had been out long enough to be in paperback, had them signed, and went my merry way down Oak Creek Canyon to my comfy reading chair that waited patiently for me beside the woodstove. Let it be said that these novels are not short. Each one is right around 800 pages as I remember, and it was just a very good thing that I had a few days off. I marathon-read the first two, and was hard-pressed to leave the third to get up and go to work. I am a readaholic anyway, but hand me a page-turner and I am lost to the world for the duration. Of course, I bought the latest in the series soon after, and over the years I snapped up each in the continuation of the series as it hit the bookstores. They never disappointed; I was glued to the pages, almost for lack of food, until the last one was turned. Fast forward a few years, and I was walking out of Waverley Station in Edinburgh. There, in Princess Street Park adjacent to the station is a (huge) monument to the poet and author, Sir Walter Scott. After a day of wandering the Royal Mile and the Castle, we passed by the Monument again on our way back in to the station. As the train rumbled its way up the tracks toward Stirling where we were staying, I slowly saw the connection between the name of the train station and its proximity to the Monument to Scott. I had read Rob Roy and Ivanhoe. Okay, not really. When I was quite young, I heard them read by my father (in his wonderful accent blend from Eastern Canada, Downeast Maine and Boston) when it was my older brother’s turn to choose the books for our nightly family reading sessions. But I remembered that there was another reference for them….the Waverley Novels. Quick research when I got back home showed the two that were familiar to me were part of a long series of novels of which Waverley was the first. Waverley is still regarded as the first historical novel written (in Western literature, anyway) and it takes place just prior to, during, and after the Jacobite Rebellion of 1745. It was very interesting to read a Scotsman’s take on the subject written just short of one hundred years after the fact. The story line is a good one: political upheaval, choices made, love, daring, and fighting for the Cause. Scott uses his poetic nature to tell the story, giving a lot of symbolism to his characters. I’d rather encourage you to read it than go in to more detail. The classics need more attention from the modern reader. 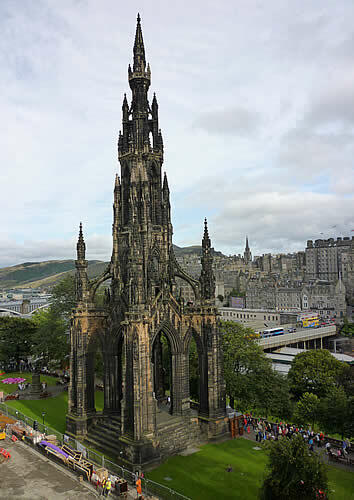 This entry was posted in Ancestry, Eco-travel, Edinburgh, Edinburgh Castle, Poetry, Scotland, Scottish ancestry, Self drive Scotland tours, Travel, Uncategorized, Women Writers and tagged "Outlander" Book series, Diana Gabaldon, Scott Monument, Sir Walter Scott. Bookmark the permalink.